Bring a pot of salted water to a boil. Add the chicken and poach until cooked through, 15 minutes. Remove from water and let rest on a cutting board for 5 minutes. Give the chicken a rough chop, put it in a bowl and stick it in the fridge for a few minutes to cool. 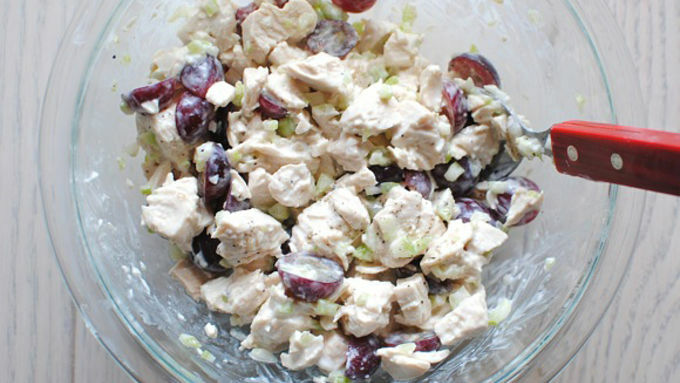 Bring the bowl out of the fridge, and add the yogurt, grapes, celery and a pinch of salt and pepper. Mix to combine. 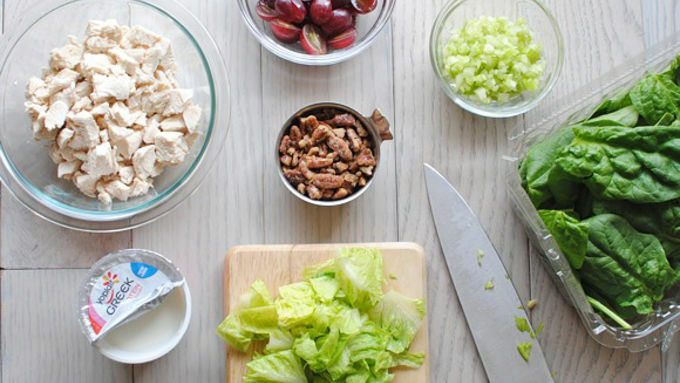 Evenly arrange the salad greens among two dinner plates. 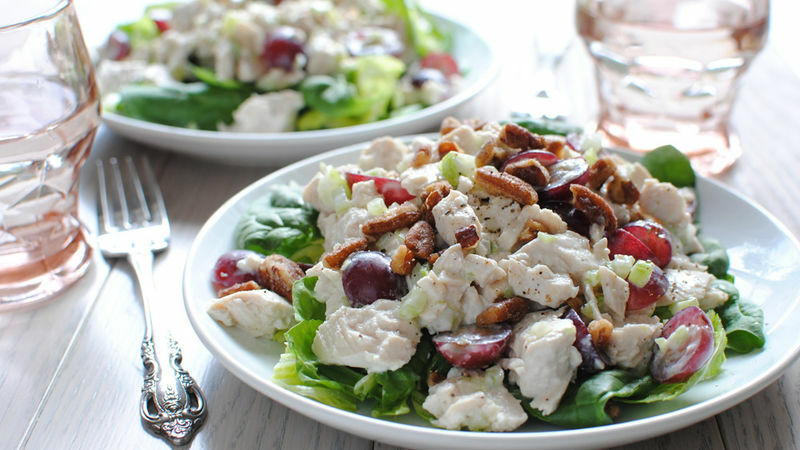 Top with chicken salad mixture and garnish with candied pecans. Serve immediately! 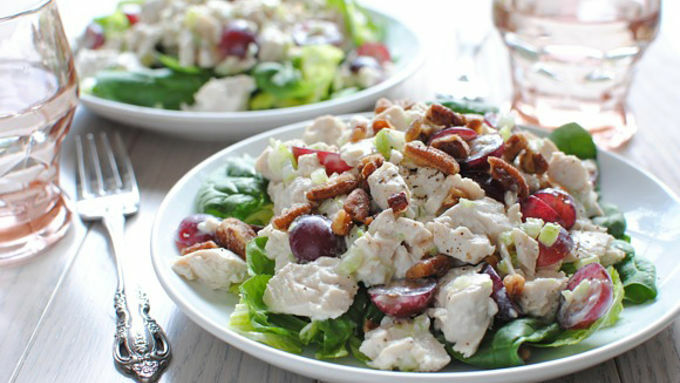 Greek Yogurt Chicken Salad takes a summer favorite and replaces heavy mayonnaise with lighter, tangy Greek yogurt. This is like the freon of food. No, really. Homo sapiens need coolants too, ya know. I mean, sure, we have the waters of the oceans and the natural breezes of the earth. But I'm talking about another level here. I'm talking about a creamy, crunchy, cool, crisp level that have will you scoffing the very presence of heat. I'm guessing you already know what it is based on, um, this entire post. But let me build it up anyway. Drum roll please…….Greek. Yogurt. Chicken. Salad. Omg, all that cool Greek yogurt coating poached and chopped chicken, please. And do we need to even mention the cool grapes and the cool celery and the cool mixed greens? I'm basically freezing talking about this. This recipe is a breeze, but to make it even quicker, you could also use leftover chicken here. Then you plate! Mix the greens together, and arrange them on your plates. Then top with the chicken salad. And finally, garnish with the candied pecans. And then get right up in it and sing love songs. Look at you all coooool.